Due to the extremely wet weather the Tree Lighting Ceremony for 2008 was held in the Recreation Room instead of the Green on Saturday 13th December. However this did not put people off with more than 100 attending, some standing outside. The Reverend David Henson who usually leads the Ceremony was unable to attend due to ill health, everyone wished him a speedy recovery. The proceedings were led by Parish Council Chair Brian Suart. 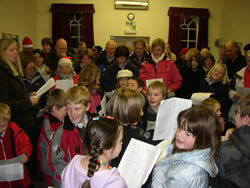 Everyone joined in the singing of a selection of popular carols, two of which were led by the schoolchildren who sang the first verses. The children also sang a special song of their own with great enthusiasm called "Come and join the Celebration", enjoyed by everyone. 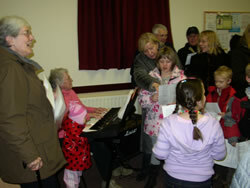 Mrs Irene Charman played organ again this year and the reading and prayer were carried out by Mrs Jean Madin. 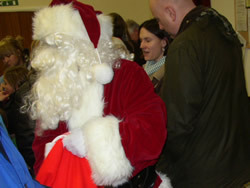 The children were then encouraged to shout as loud as they could for Father Christmas who duly appeared handing out sweets to all. Afterwards, three different tasty homemade soups were served by Jo Bruce assisted by her two daughters Daisy and Rebecca and Pauline Stewart. The soup was made by Jo and Mrs Marion Brown. Although it was a much shorter ceremony than normal, due to the Recreation Room being booked at 7pm, it was enjoyable with a warm and friendly atmosphere. The tree lights were switched on during the ceremony enabling everyone to see them as they left to go home. Many thanks go to Hugh Smith for donating the tree, to all involved in the organising and to those supporting.